CRAZY DISCOUNT! Was: $589.95 Now: $99.97! Liven up the indoor playing time with the 12-in-1 Multi Game Table. The versatile game table will allow you to switch back and forth from one game to another. 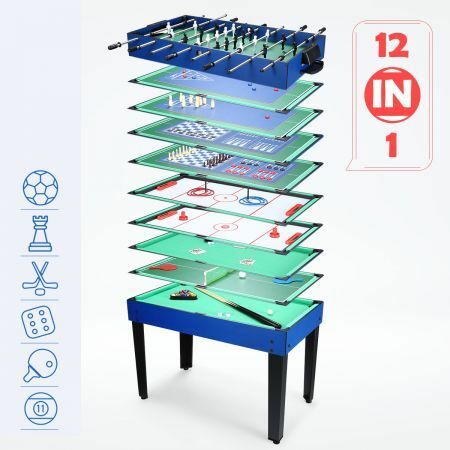 The game table contains 12 classic games, including soccer, pool, hockey, ping pong, chess, bowling, shuffle, draught, backgammon, toss game, horse shoe, poker card. The table will offer hours of fun and action for your family, friends and customers. Constructed from sturdy and durable MDF material, the multi game table is long lasting in your house, bar, club, lounge, company and other places. 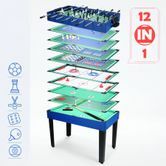 All the necessary accessories are wrapped up in the space saving and economical 12 in 1 games table to have a pleasant competition between family, friends, colleagues and classmates. Great item. Fast delivery. A pleasure to deal with. Thanks.